Use this store directory to click to view a brief description containing links to contact info, map, home page, blog and photos of store merchandise and store location. BQE Billiards And Bar is a newly renovated, spacious 12,000 foot pool hall in Jackson Heights. The facility includes about 25 pool tables, so you can frequently walk right in and begin playing. There are also other recreational games including foosball, ping pong and air hockey. BQE serves hot food and cold drinks. Sundays you can relax and enjoy NFL Football on the bar's large flat screen TV's. BQE also caters to large parties and kids parties for a competitive cost. Click on the link above or below to view the party packages being offered for kids party rooms in Jackson Heights. En espanol, click aqui para fotos de Billar in Jackson Heights Queens / telefono para Billares en Jackson Heights / mapa a cuarto de Billar en Jackson Heights Queens. 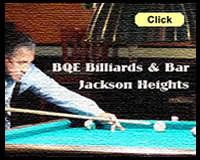 Click this link to view the home page of BQE Billiards And Bar - pool halls in Jackson Heights Queens. Click this link to go directly to the photo album to view photos of the BQE Pool Hall in Jackson Heights Queens. Click this link to obtain a map of the BQE Pool Room in Jackson Heights. Click this link to obtain business listing, including the telephone number and street address of BQE Billiards And Bar in Jackson Heights. Ponce De Leon Federal Savings Bank in Jackson Heights has been serving the community for well over a decade. The bank holding company dates back to the middle of the last century and it has grown into a strong regional bank ever since. We provide a full line of community banking services. Come in to visit us to see how we can help you. Ponce De Leon Federal Savings Bank is located along 82nd Street between Roosevelt and 37th Avenue. 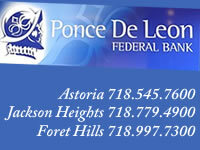 Click here to view the home page of Ponce De Leon - one of the leading banks in Jackson Heights. Click here to view the photo album of Ponce De Leon - mortgages, small business and consumer loans in Jackson Heights. Click here to view a map showing the Ponce De Leon Federal Savings Bank in Jackson Heights Queens. Click here to view the business listing for the Ponce De Leon Federal Savings Bank - Jackson Heights. This listing includes contact information and a link to our website. Lens Lab Express is one of the leading optical stores in Jackson Heights, providing a wide selection of designer eyewear, sunglasses and contact lenses for all occasions. Lens Lab Express provides on site optician services and has an on-site surface lab so that they can provide same day service on eyeglasses if required. Lens Lab also has six locations in Queens, so you have the convenient access throughout the boro. 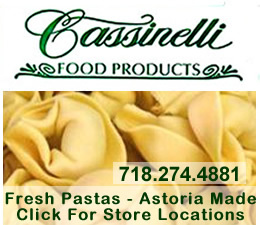 Because we buy in volume - not just for these six stores, but our other stores located around the NY Metro area, we're able to give you some of the most competitive prices in town. Lens Lab Express has five stores located throughout the boro. 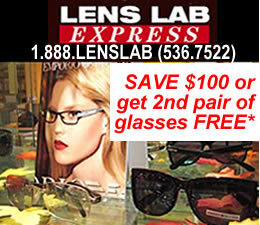 Click here to view the home page of Lens Lab Express Queens. Click here to view our photo album of sunglasses in our Astoria & Jackson Heights stores. Click here to view a map showing the locations of Lens Lab Express in Astoria, Jackson Heights, Corona, Ridgewood, Rego Park Queens. Click here to view business listing of our eyeglass stores in Jackson Heights & Queens - as well as our locations in Astoria, Ridgewood, Corona and Rego Park. We believe that real estate is about people. Whether client or customer, we provide personalized service with knowledge, honesty, respect and kindness. We manage both the emotional and financial issues inherent in all real estate transactions, and work hard to find solutions that work for buyers and sellers. Always keeping the best interests of our clients and customers at heart and striving to exceed their expectations, are what have built our reputation for integrity and customer service. We look forward to working with you whether you are selling or buying a house or apartment. 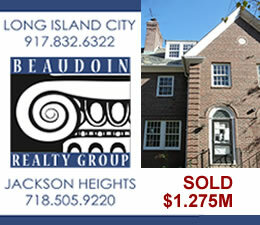 Click here to view the home page of Beaudoin Realty Group Jackson Heights. Click here to view our photo album of realtors in Jackson Heights. 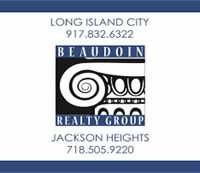 Click here to view a map showing the location of Beaudoin Realty Group one of the leading real estate agencies in Jackson Heights. 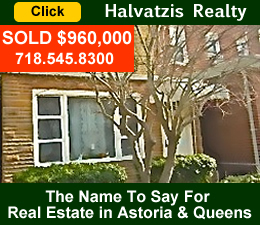 Click here to view business listing of our real estate agency in Jackson Heights. 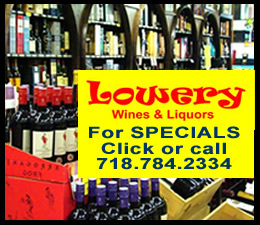 Lowery's Wine & Liquor store has been serving the Sunnyside, Woodside and greater Long Island City community for nearly 80 years. This three generation family business has grown to become one of the largest wine and liquor stores in Queens and the NYC metro area. 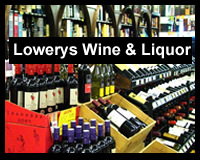 Because of our size we carry a large inventory of wines and branded liquors from around the world. La Marjolaine Bakery has been serving the Woodside and greater New York Metro area community for over a decade. This authentic french bakery has built a reputation for providing some of the finest baked goods in the New York market area. We not only sell retail, but also sell at the wholesale level, and our customers includes many of the top ranked hotels in NYC. The photo album of many freshly made french baked goods in Queens and NYC. A map showing the location of one of the leading retailers and wholesalers of french baked goods in Queens & NYC. 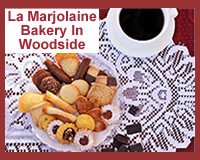 The Business Listing of the La Marjolaine Bakery in Woodside Queens. Lens Lab Express is one of the leading optical stores in Sunnyside providing a wide selection of designer eyewear, sunglasses and contact lenses for all occasions. Lens Lab Express provides on site optician services and has an on-site surface lab so that they can provide same day service on eyeglasses if required. Lens Lab also has six locations in Queens, so you have the convenient access throughout the boro. 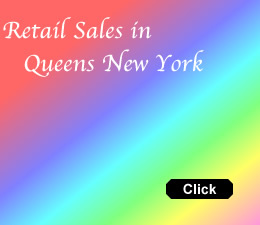 Because we buy in volume - not just for these six stores, but our other stores located around the NY Metro area, we're able to give you some of the most competitive prices in town. Lens Lab Express has five stores located throughout the boro. Click here to view our photo album of sunglasses in our Astoria & Sunnyside stores. Click here to view a map showing the locations of Lens Lab Express in Astoria, Jackson Heights, Corona, Vision World in Ridgewood, Rego Park, Sunnyside Queens. 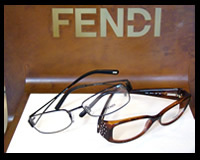 Click here to view business listing of our eyeglass stores in Sunnyside & Queens - as well as our locations in Astoria, Ridgewood, Corona and Rego Park. Click here to view the home page of Ponce De Leon - one of the leading banks near Sunnyside & Woodside. Click here to view the photo album of Ponce De Leon - mortgages, small business and consumer loans near Sunnyside & Woodside. Click here to view a map showing the Ponce De Leon Federal Savings Bank near Sunnyside & Woodside in Queens. Use this store directory to click to view a brief description containing links to contact info, map, home page, blog and photos of store merchandise and store location. 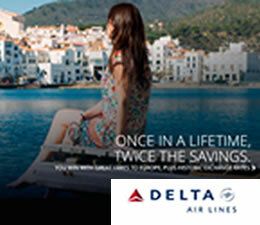 Many of our advertisers periodically post specials. LIC Massage Therapy is one of the leading masseuses in Long Island City and Queens. Call for a free phone consultation. We offer very competitive rates that are good value for the money. LIC Massage Therapy specializes in Swedish Massage therapy. The LIC Massage Therapy masseuses are licensed and have graduated from American massage schools. The company's founder is an experienced masseuse who also works at the prestigious Yale Club in NYC. Click on this photo above to view the home page of LIC Massage Therapy in Long Island City. The home page contains an online map, telephone number, photo slide show as well as more in-depth information about the massage technique and practice. The Art Of Health Chiropractic is one of the leading chiropractors in the Long Island City LIC neighborhood. Dr. Angelo Ippolito, Doctor of Chiropractic, takes a holistic approach to chiropractic care by also providing clients with nutritional counseling. 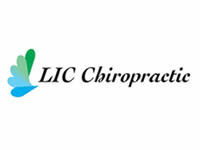 The home page of one of the leading providers of chiropractic care in Long Island City LIC. The photo album shows our chiropractor's office in LIC Long Island City. A map showing the location of Art Of Health Chiropractors in LIC Long Island City / Queens. The Business Listing of Art Of Health Chiropractic - one of the leading chiropractors in LIC Long Island City. The LaGuardia College Performing Arts Center is one of the leading providers of entertainment in the Long Island City neighborhood. 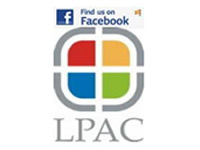 LPAC, as the theater is frequently referred to, provides a continous array of musical, film and theatrical performances - some of which are free to the public, compliments of government and foundation grants. 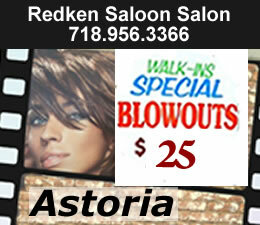 The home page of one of the leading providers of entertainment in Long Island City LIC. The photo album shows some of the past performances by the LaGuardia College Performing Arts Center in LIC Long Island City. A map showing the location of LaGuardia College Performing Arts Center in LIC Long Island City / Queens. The Business Listing of LaGuardia College Performing Arts Center in LIC Queens. 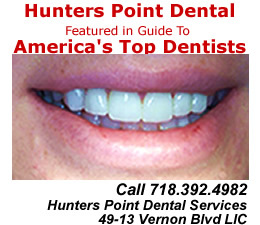 Hunters Point Dental Services is home to two of the leading dentists in the Long Island City LIC neighborhood. Daniel Weinstein, DDS, and Elie Marzouk, DDS, offer top flight dental services at competitive prices. Click the icon to your left to see our offices and a list of the dental services we provide to residents of Long Island City, Astoria and Sunnyside. The home page of two of the leading dentists in Long Island City LIC. The photo album shows our dentists office in LIC Long Island City. A map showing the location of Hunters Point Dental Services - dentists in LIC Long Island City / Queens. 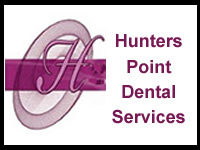 The Business Listing of Hunters Point Dental Services - home to two of the leading dentists in LIC Long Island City. 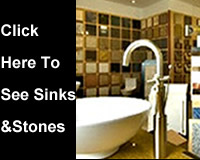 Sinks & Stones is one of the leading kitchen and bathroom tiles stores in Queens. The owners have been in the stone and tile business for two generations, and they bring to you all of the knowledge, experience - and as needed - information regarding qualified service providers required to make your kitchen and bathroom look the way you want. We also carry a full line of sinks, faucets and other fixtures for kitchens and bathrooms. And we sell at both the retail and wholesale levels. 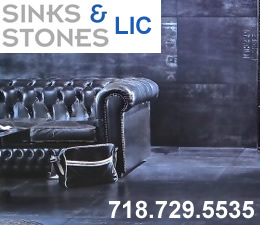 The Business Listing of Sinks & Stones for bathroom & kitchen tile in LIC Queens. 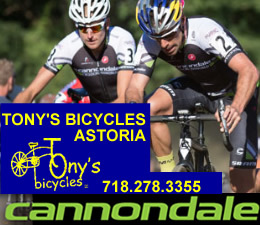 Click this link to return to Jackson Heights & Elmhurst Neighborhood News / Jackson Heights & Elmhurst Restaurants / Jackson Heights & Elmhurst Maps / Jackson Heights Business Directory.